The tomatoes took their time this year - like I wish I had. The farmers on Long Island say they treaded through a cold and rainy spring like the rest of us; that manifested in a lazy summer of slowly ripening on the vines until nearly the second week of August. To be honest, the late tomato harvest feels a little ominous - like a premature sign of the climate change we all know is coming and don't quite want to admit to ourselves. It's weird and I don't feel great about it. Now that tomatoes are finally at their peak, the summer's nearly over. Anticipation is the best part though, right? Back in late July when the tomato anticipation got the best of us, we succumbed to using green tomatoes. 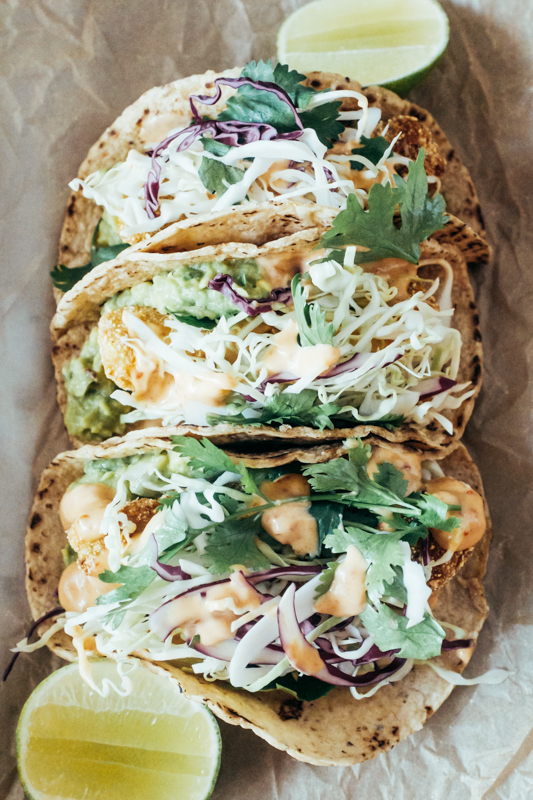 Enter the green tomato taco: a friendly foil to looming climate change that makes....green tomato tacos.... out of green tomatoes.... know what I mean? 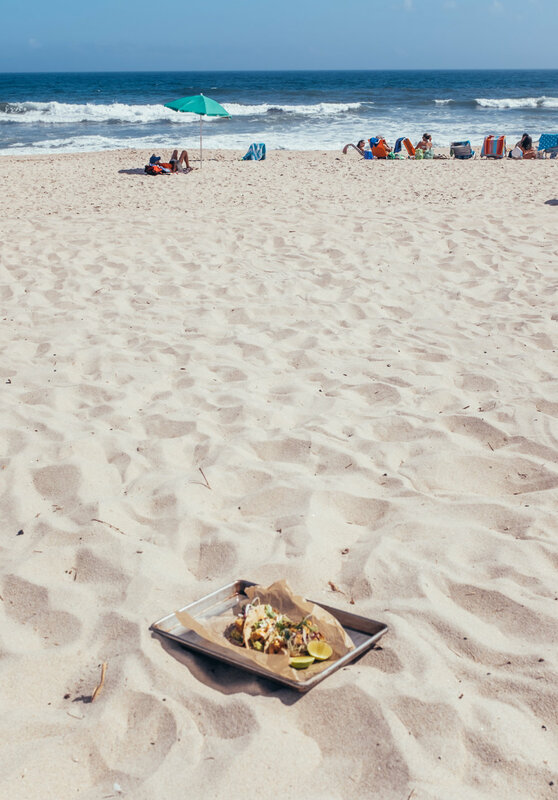 These are basically Baja fish tacos with tomatoes in lieu of fish. In the words of Brooks Headley, they're "accidentally vegan." We use Brooks's chickpea mayonnaise from the Superiority Burger Cookbook for the sauce, but you could easily replace it with regular mayo if you're not into that kind of thing. Is our mutual crush on Brooks Headley showing yet? Brooks, are you reading this? Are you dating anyone right now? Nevermind. Slice tomatoes into ½ inch slices. Then slice across in ½ inch slices so you have long, thick pieces that look like a fish stick. Sprinkle kosher salt on both sides of the tomatoes and let them sit on a rack for at least 30 minutes, up to 2 hours. They should release some liquid – discard it. Dry the tomatoes with a kitchen towel to remove excess moisture. Place cornmeal, flour, and dairy-free milk in three separate bowls. Heat 1/4 inch of oil in a cast-iron skillet or shallow pan over medium-high heat. Meanwhile, dip each tomato piece into the flour, followed by the “milk”, and then the cornmeal. Place on a clean rack. Repeat with all of your tomato sticks (you don’t want to do this too far ahead or the cornmeal crust will absorb a lot of moisture from the tomatoes). 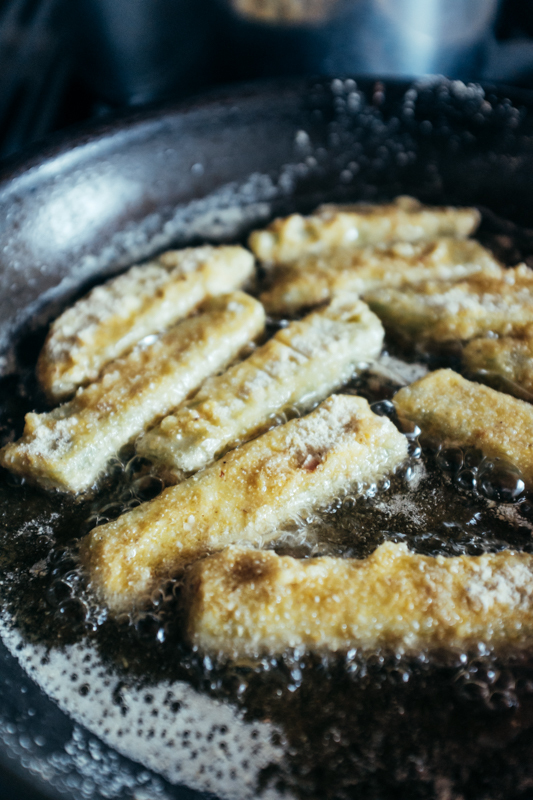 When the oil is hot (test this by dipping a little batter into the oil and seeing if it sizzles), add the breaded tomatoes and fry until golden brown on one side before flipping. Remove the from the oil when they are golden all over and place on paper towels or a clean rack and sprinkle with salt. You’ll want to fry the tomatoes just before serving so they don’t get soggy. Combine chickpea mayonnaise, chiles in adobo sauce and, lime juice in a small food processor with finely grated garlic. Blend to combine together and add salt to taste. Toss cabbage with lime juice. Heat corn tortillas in a large cast iron or non-stick pan until they’re malleable and warmed. Do not over lap them, just lay them flat in the pan and flip once. Place 1-2 pieces of fried tomato in each tortilla. Top with cabbage, aioli, cilantro and, guacamole. Serve with a lime wedge. *From the Superiority Cookbook which is amazing & we highly recommend. Killer vegan mayo recipe that's easy to make and not full of crappy ingredients. Make buckets and keep it on hand!